Happy 4th of July! What to suggest for America’s special day, full of parties and picnics? I am sure everybody has their own favorites to grill – burgers, hot dogs, steaks, maybe even roasts or tenderloins on the grill. 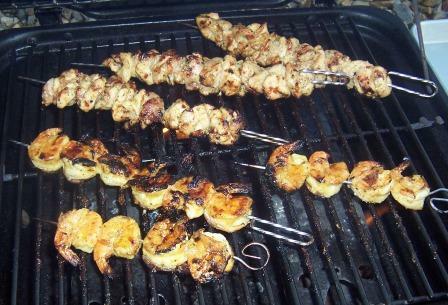 Here is an inspiration for a marinated chicken thighs and shrimp that are easy and fast to grill on skewers or in flip basket. Clean your chicken thighs from excess fat and cut into similar size pieces. De-vein your shrimp (if not already done from the store) and don’t peel it. Mix all the ingredients for a marinade together in large bowl and pour half over the meat. Pour the rest of the marinade over the shrimp in separate container. Let it marinade for at least 1 hour (the best is overnight) in air tide container, in the refrigerator. Use skewers or grilling flip basket and grill, turning occasionally, until the meat is done. The shrimp only takes few minutes, the chicken slightly longer, depends on the size of pieces of meat. I will cut all kinds of veggies I have on hand, incl. raw potatoes (skin on) into similar size pieces. Season it with salt, freshly ground pepper, mix in few strings of rosemary and sprinkle with olive oil and balsamic vinegar. Mix in iron pan (or other grill-save dish) and put on the grill. Mix with wooden spoon until done. The flavors and aroma are just divine. Since I used a generous spoon of cayenne in my recipe, I paired this grilled treat with red wine without hesitation. Even the label of Garnacha de Fuego that we opened, suggest the fire of the grill – well,maybe. This bottle is worth to open specially if you don’t stop with the chicken and move on to burgers or steaks. 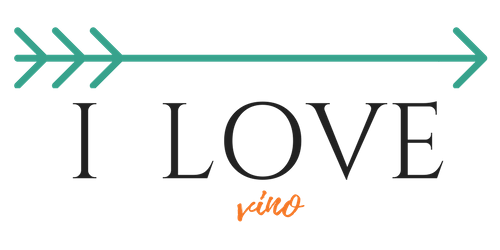 This truly is superior party wine and great value! It worked well with my skewers even though it is a rich and fruity red wine. If you skipped cayenne in your marinade, you might want to grab something lighter in body – Italian Chianti or Pinot Noir. In case you prefer white, I picked really great White Burgundy from Louis Latour Chardonnay Grand Ardèche – rich, round, really tasty and wallet friendly wine.